David Mallett in his salon at 14 rue Notre Dame des Victoires, Paris. Photo courtesy of David Mallett salon. Situated in the heart of Paris—in the Second Arrondissement and housed in a 17th-century setting—the David Mallett salon exudes an airy happiness with a wonderful sense of humor and chic bien sur. Although I didn't get a chance to meet the man in charge personally, due to unforeseen circumstances, his incredibly stylish-looking staff was there to greet me with open arms. But first, I must talk about Mallett’s taxidermy collection at the salon. Mallett loves animals—the exotic ones—and they are lounging about in various areas of the salon, which adds inexplicably quiet excitement. This gave me a sense of what he is all about—quietly funny and animated. 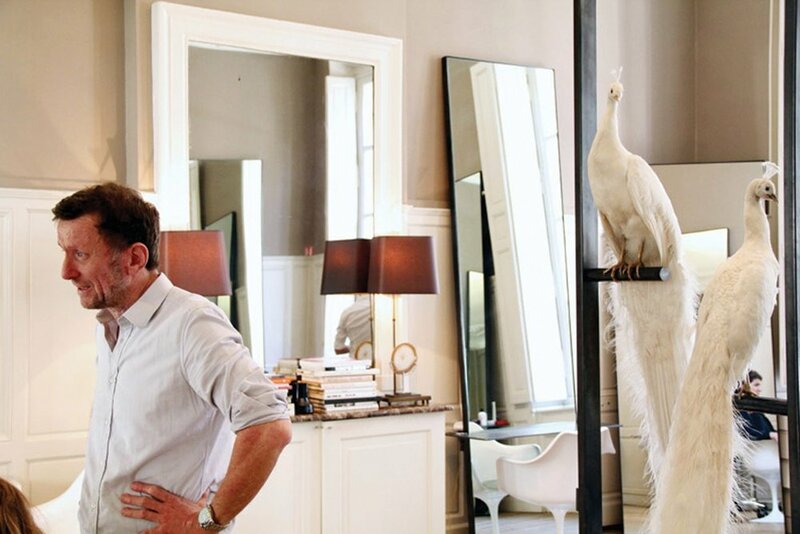 Left: Then, Vanity Fair's beauty director visits David Mallett's Paris salon. Photo by SunHee Grinnell. Right: David Mallett hair products. Photo courtesy of David Mallett salon. Mallett’s been obsessed with hair since the age of four, and he's never stopped obsessing. Born in Australia and determined to succeed, he made some waves in his hometown, then ultimately made the move to Paris at the age of 27. It was there that his love and obsession for hair was reciprocated by mega-talented creators such as French Vogue editor Emmanuelle Alt and acclaimed fashion photographer Jean-Baptist Mondino. And then the rest of the celebrated crowd followed, from Bettina Rheims to Peter Lindberg, as well as famed celebrities, from the likes of French staples Charlotte Gainsbourg and Rampling to superstars like Natalie Portman and Kate Winslet. Clients from all over the world seek Mallett’s salon, as it is known as the place to be when in Paris. And Mallett’s salon's options just got a little wider, as he is also servicing his clients at the new and stunningly refurbished Ritz at Place Vendôme. But if you can’t get yourself to Paris, David Mallett can come to you via his beautiful nourishing and styling hair line. From hydration to volume, he covers the essential needs of one’s hair, with his hero product being the serum, which was three years in the making. “I first realized that I needed to make a serum when clients said they had to go away for the weekend and they wanted their hair to look amazing but didn’t want to fuss with it,” according to Mallett. The Hair Serum is extremely lightweight but highly hydrating, and it has now become my travel mate. Then there’s the Volume Powder, which sprays extremely fine and mists so light that it’s clump-proof (as shown to me by stylist Benedikt Seehofer at the salon. One should lift the hair, then mist into the air so that the hair to catch it—don't mist directly onto the scalp). And let’s not forget the Australian Salt Spray and—recently out—the all-in-one Hair and Body Wash, for those no-fuss folks. Finally, to illuminate all this hair goodness, the new Gold Dust mist is a must, as it’s simply irresistible for all shades of hair. Truly divine all around, Mallett's products and his salons are a must to experience. The David Mallett salon at the Ritz, Paris. Photo courtesy of David Mallett salon.